Perhaps it's because we are on the eve of Memorial Day, perhaps it's because Mother's Day recently passed or, perhaps it's because I've been experiencing such tender feelings for my children lately (thanks to them sharing their lives with us via their blogs), or, just perhaps, it's all of the aformentioned and more; I've been contemplating establishing my own blog. So... ta da... here it is! Because it is the eve of Memorial Day, 2006 and because I am thinking about and missing my Mutti so much, I decided now is the time to get started. If you didn't know her, I'm sorry. If you did... you know what I mean when I say she was awesome! 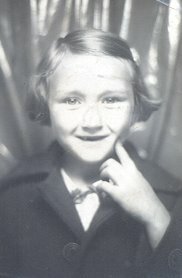 My Mutti was funny, kind, talented, caring and smart. It never ceased to amaze me how smart she was, and non-chalant about it, too. She was unpretentious, some times even had a feeling that she was lacking but most of all it was her love of life and love of her family and friends that inclined people to gravitate to her. Of course her awesome cooking abilitlies were a yummy bonus! It was often said that when my Mom and Dad got married (in February, 1954) my Mom couldn't boil water. When she passed away in February, 2002 she was a very accomplished chef (although she wouldn't refer to herself as a chef)! She grew to love cookbooks, was a test kitchen for Betty Crocker (she 'earned' coupons for food which is how she helped contribute to the family income). Many people helped her in her quest to improve her cooking skills. My Grandpa and Grandma Blakeley helped start her collection of cookbooks as a newlywed. I don't even know if we counted how many cookbooks she had in her collection when she passed away. I know there were two, floor to ceiling, bookcases filled with her cookbooks and food magazines. Many of my fondest chilhood memeories are tied to my Mom in the kitchen baking up yummy stuff. I know that's one reason why food is a comfort to me (and why I'm fluffy!). Last week Heather and I got togehter and made stawberry jam - my first attempt without my Mom here to coach, guide and join in the fun. Of course I didn't read the directions right and although our strawberrry jam tasted good, it was more like strwaberry syrup because I didn't add enough pectin. Heather was a trooper. I wish I would have taken a photo of her with her apron on, berry juice up to her elbows and her pregnant little tummy barely noticeable under all the jam making spots! This experience in the kitchen with Heather led me to thoughts about my Mother. How did she do it everyday with six children underfoot? I told Heather if I were a better Mother and wife, we would have been enjoying the fruits of our labor by eating our homemade strawberry jam on fresh homemade bread, still warm from the oven. That's what my Mom did. She made bread the same day she bottled jams and jellies. Then she'd share with us and it was heavenly! I remember once my Mom saying "Whoever invented bread must surely be in Heaven." I really could go on and on and on and on (just like the energizer bunny) about my Mutti. I send hugs and kisses to her in heaven everyday. When she isn't visiting with her family and loved ones, she is most surely seeking out the creator(s) of bread as she knew and loved it. She told my husband he was brave to marry me! I love how she incorporated life in with her butter! Yes, I love my Mutti. Since she chose to be creamated, I don't have a graveside to visit on special occasions that remind me of her, her birthday and Memorial Day. My sweet Dad made vaults for each of us and shared her ashes with us, too. Whenever I feel like giving her a hug, I hug her in her vault. She goes with me when I go to places I love and I know she would love being there too (she'll be accompanying Val & I to Wyoming this weekend). I love my Dad for using his woodworking talents to make each of his children a vault so we can each have her with us, always. I know I referred to my Mutti in present and past tense, which may seem wacky to you. However, I know her spirit lives on and she is with us and loves us, still. Thanks for sharing this special time with me as I pay tribute to my Mutti. I love each of you! During the little escapade of getting your picture to look just right, I saw a large version of your picture next to the one of your mom. You look just like her. I feel lucky to have known her and to know you. You are both incredible women. I miss Grandma Blakeley. A lot. This was the perfect first post. I really enjoyed your post, I miss Grandma Blakeley so very much. I really love having you there to remind me of how kind she was though, and the way she looked and the feeling of welcome she "emitted" I feel from you too. I love your company and wish I had more time with you and dad too. You do your mother proud and as a sister you are quite inspirational. Thank you for putting down in words for the whole world to see what many of us have felt but not been able to capture and articulate quite so eloquently. You are an amazing person and I count myself doubly blessed for having you as a sister.